At Limpid Jewelry, laser technology allows us to create detailed pieces that were once not possible. Laser machines are becoming an essential piece of equipment to create your orders. 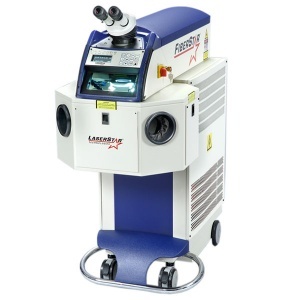 Technologically advanced Laser® Star welding machines are now used to meticulous repairs, fabricate and design custom pieces, set gemstones and resize rings. Laser marking system is being used for laser engraving. Laser engraving has become a common practice which has created many opportunites not possible by hand engraving. Porosities, cavities and cracks can be repaired with the same metal, instead of low-grade filler that will cause future problems like discoloration and melt-out. B) Repair metals close to fragile gems. Eliminate removal of fragile stones in soldering process. Precision of metal build up and lack of harmful fire and heat eliminate possibility of stone damage. Saves time and increase productivity. Since lasers produce “spot” welds, there are no solder runs or shifting of parts during heating as with conventional soldering techniques. Combination of all metals can be welded, even combinations of Platinum, Gold, and Silver. Delicate and antique items can be restored without concern for distortion and dissolving of previous repair work. Reduces time for finishing- Saves time and money by eliminating steps associated with soldering, such as removal of fire scale and re-polishing. Welding any size jewelry piece from large castings to tiny filigree wires. Welding thin stamping plates to delicate findings.